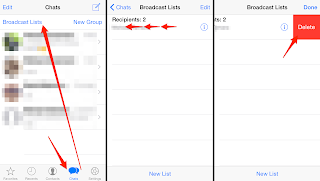 Send messages to multiple users on WhatsApp - Here is how you can do it ! Exchange of Communication from user-user has been more flexible with latest features in Whatsapp and here we explain about sending messages to multiple users on messaging platform without creating a group. which enables you to message multiple contacts at the same time and that to without adding them to any group. With the help of above mentioned feature one could send messages up to 256 people at the same time. But make sure that you have their number stored in your phonebook. Open WhatsApp on your device and click on the Chats tab placed at the top of the app window. Now tap on the three vertical dots located on the upper right corner of the main screen. Now you will notice the option on Choose New Broadcast. After this, you have to select all the names that you wish to include in that list. Once done just tap on the green tick placed in the lower right-hand corner and you list is ready. Now click on the chats tab placed at the bottom of the homescreen of the app. Once done just tap on the Broadcast Lists option located in the upper right-hand corner. Select the new list and mark the checkboxes placed next to your contacts. Once done your list is now ready and you can message everyone in one go.